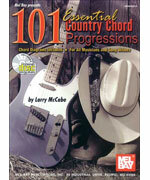 This book will help you play and write songs in both contemporary and classic country styles. The book is for music students, teachers, performing artists, recording studios, composers, songwriters, advertising agencies, and any person or music company who needs a user-friendly, comprehensive reference guide to country chord progressions. Specific chord fingerings are supplied for guitar players. The stereo CD makes the book an ideal tool for study or jamming. No note reading is required. Blank treble and bass staves are included for writing songs, licks and solos. A concise discussion of song form is provided to help beginners understand the structure of country songs. Overall, a great learning and reference tool for beginners and pros alike. All creative musicians and writers who study, perform, or compose country music will benefit from this book. In this comprehensive study, Joe Carr presents all the major country guitar styles in tablature and standard music notation. Beginning with basic chords and strum patterns, this book/CD combination covers flatpicking, fingerpicking and the major country lead styles including Rockabilly, Swing and modern electric.